The belt loops are temporary--I used pop rivets through the snaps to hold the loops to the holster, and the loops are scraps of slightly thicker leather of unknown provenance rather than the proper vegetable-tanned holster leather. The front button part of the snap wouldn't crimp right with the extra thickness, so I wound up using backs on both sides of the snap. I don't like the belt loops as I've got them, but I think I can improve them, and give some adjustment capability without major effort. I measured the thickness of the slide, and added half of that to the gun for the pocket sewing. Worked out well, except I think I will go a little closer for the bit of stitching just below the trigger. I'll probably do the next version as a tuckable with clips--not so much because I want to tuck my shirt in, but because I think I will be happier with clips than loops. Clips will give me more leeway around the grip area, and are a bit less bulky. I may also reinforce the mouth of the holster, this one doesn't stay open as well as I would like when the gun is removed. This isn't quite as comfortable as my Minotaur, but it is also for a much larger gun--The XD I carry in the Minotaur is an inch shorter in both barrel and grip. I'm not used to carrying a full-sized gun. When we left off, we had 2 pieces of leather sewn together. I finished that holster without taking more pictures, so I will continue with a different holster, this time for a Keltec P3AT, a simpler design than my first attempt. I'm still experimenting, and this time I tried pre-dying the pocket area of the holster back before assembly. I also used a smaller pocket on this holster, since the last one was far too big. I may have gone a little too small, the pocket was barely big enough. The next step is molding and boning. Get the leather wet--not sopping wet, just run it under warm water, making sure you get inside the pocket. Blot it dry, and set it on a towel for 15 minutes or so. Unload the gun, make sure it is unloaded, then assume that every time you turn your back, someone might come and load your gun so you have to check again. You will be handling your gun in odd ways, it will be very easy to violate Rule 2, so it is doubly important to make sure it is empty. Put the gun in the holster, wiggle it around until you have the depth and angle right. The professional, high-volume makers have presses with rubber that does the initial rough shaping. Although it is not necessary, I have had good luck with doing the initial shaping in a Foodsaver vacuum bag--not only does the vacuum begin the process, the bag protects the leather during boning. The Foodsaver brand bags have texture on one side which can get transfered to the leather, although it rubs out fairly easily. I put a paper towel around the holster, both to avoid the bag texture and to absorb some of the moisture. I also make sure I put the back side of the holster against the textured side of the bag. I may leave the texture on a future holster. The front of the trigger guard on all guns, and the ejection port on a semiauto are two of the critical areas--these details help hold the gun in place firmly but without excess friction, so they should be deeply and crisply boned. Make sure you do NOT mold to the trigger itself. Push the leather into these spots with whatever smooth, rounded tools work--old pens, knife handles, clay working tools--I did a lot of the boning for this holster with a sharpie marker and a butter knife handle. 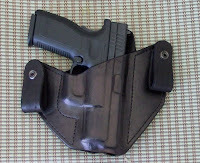 Ideally you will follow creases and contours, so the inside of the holster is a close match to the gun. If you use a vacuum bag, touch up the details outside the bag, with the gun still in place. Remove the gun and dry it off. Let the holster dry in a warm, dry place. Once the leather is dry, touch up the edges--make sure they are properly beveled, sand off any burn marks and loose bits. Once the edges are good, burnish. I use a 3/8 dowel chucked into my drill press at a medium speed. Rub the edges along the spinning dowel. I've sanded the tip of the dowel to a rounded point that lets me get into the belt loops. I'm not going to cover dyeing--I'm not that good, I basically rub leather dye on until I get a reasonably even coat, then wipe it off and let it dry. Q tips for the belt slots. If I keep this up, I'll likely get enough dye to dip. This holster was designed for my wife. She doesn't like gunbelts, so the belt loops are sized for the biggest belt she's willing to wear. I don't think a gunbelt is necessary with small guns It was too tight initially--the stitching along the top of the trigger guard should be 1/8-1/4 inch wider. I put the pistol in a baggie, holstered it overnight belted to a range bag. If I were re-doing it, I would also make the front leather match the shape of the back near the rear sight. I had her put it on to test it. She forgot to take it off. I consider that success. I'm doing a fairly simple pancake holster for my J-frame. First step is to make a pattern--I've got a big roll of heavy craft paper which seems to work well enough. I make a tracing of the gun, then add about half an inch depending on the thickness of the gun. (I'm guessing that the actual measurement you want is about half the thickness of the gun--As I mentioned earlier, the P3AT 1/2 inch was way too big. This piece will help lay out the pocket. Also mark the position of the trigger--I made a cut in the paper so I could easily mark on other patterns or leather. 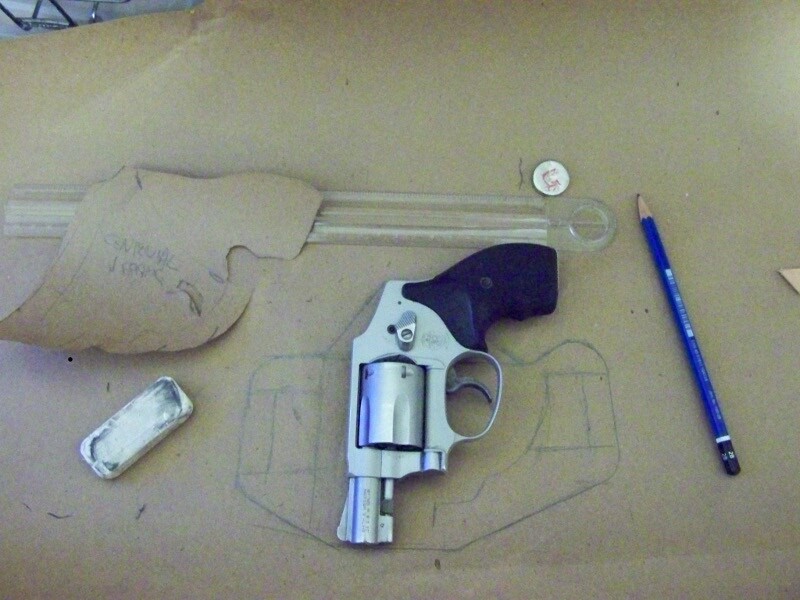 Next I traced the width of a gun belt on fresh paper, and laid the pocket pattern on top. I then did a rough sketch of what I wanted, making sure that I had at least 1/2 inch of leather around the belt loops. I laid out the back, which was supposed to have a sweat shield. (I'll get to that in a bit) Make sure you have adequate clearance to get a good grip without running into leather. I also sketched the proposed front side. Being a revolver, it should be right at the cylinder edge--too high and it will be very difficult to re-holster. I went a little high, to trim after molding. I cleaned up my sketch, straightening out lines, and making sure the radii (plural of radius, right?) were not too tight. The ruler I was using had a circular end about the right diameter. I would say a quarter is close to the minimum size you want. Attach this to another piece of paper (I folded in half, and paper clipped the other end) and cut the back side out. You will have two backs, one of them marked for where the front is cut. I then use a hole punch to make holes at the top and bottom of each loop, and to help align the pieces. Put the unmarked back piece aside for now. and cut the sweat shield off the marked piece to become the front. Use the pattern to trace the outline onto the rough side of the leather. I do the belt loop holes first to make sure I maintain alignment. Also trace the pocket, so you know where NOT to glue. Cut the leather--A razor knife or tin snips work for me. Cut just slightly large. 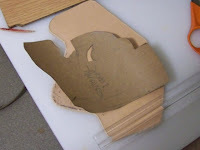 Once the pieces are cut, put glue on the rough sides where the pieces will be together. Do not put glue where the pocket or sweat shield will be. Let the glue dry for about 15 to 20 minutes. If you are married, you may want to do this outside, my usually forgiving wife complains about the smell every time I use Barge cement. Contact cement bonds instantly on contact with itself, so you must be careful to get the alignment right the first time. Use a razor knife to trim any leather that isn't aligned on both sides, and any areas where the holster is too far from the pattern. 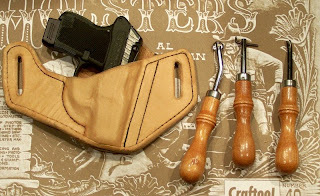 Sand the holster down to the actual pattern--I use a bench grinder for large areas and roughing in, and a Dremel with a sanding drum for final touch up and inside curves. I suspect with more practice cutting, I could eliminate most of this step. This would also be a good time to lay out and cut your belt slots (I did mine later in the process) using the holes cut in the paper pattern as a guide. Be careful to leave enough leather around the slots, especially along the top. I used a 1/4 inch drill bit to do the ends, then cut from the holes toward the center with a razor knife. I have a 1/4 inch bit with rasp sides that I used to smooth the holes up. 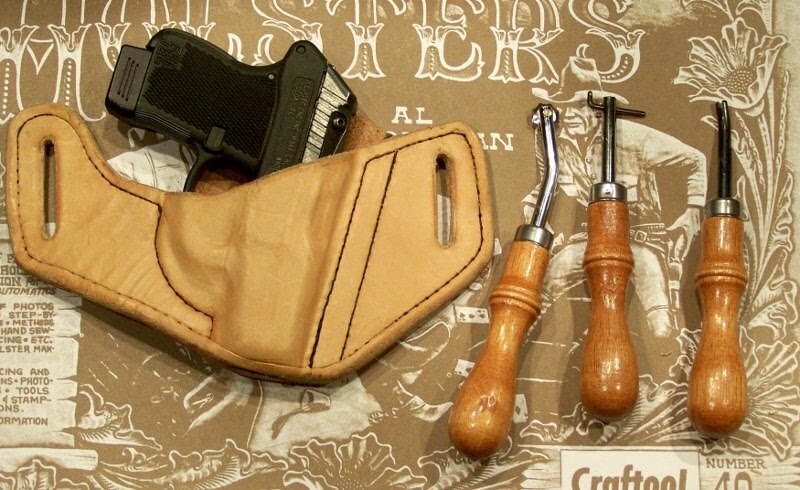 Use the pocket pattern to lightly lay out guide lines where the pocket stitching will be on the front side of the holster, matching the marking you made for glue. Using a freehand groover if you have one, or an adjustable edge groover if like me it is all you have, cut the lines for the pocket. The lines should not go all the way to the edge, they should stop where the edge grooves will be. Adjust the edge groover to the distance you want your stitches from the edge. Cut a groove from the top of the pocket stitch groove around the holster to the bottom on each side. The top and bottom of the pocket itself should not be grooved. Go slow around the corners, and keep the cutter aligned properly with the radius. Edge groove front and back, don't groove the back of the pocket stitching until you've drilled the holes. For larger guns you may want to stitch around the belt slots, this would need a groove as well. I plan to go closer to the edge with my next holster. Run a beveler around the edges, especially any back edges that might contact bare skin. You may want to skip the pocket for now, if you plan to trim to fit after wet molding. Make sure you bevel your belt slots when you get around to cutting them. With a squirt bottle or a wet finger, moisten the groove. Use the overstitch wheel, mark along the damp grooves to make stitch placement guides. Go slow around the radiused corners, and where possible start on the sharp corners with a point of the tool in the corner. With an approprite sized drill bit (about the size of the needle, big enough that stitching can be done without tools to pull the needles through except when backstitching. I made a bit out of a bicycle spoke sharpened with my bench grinder and a file. Works well enough. I use a drill press, the Tandy Leather manager recommended a dremel. Use scrap wood on the back side. Once the holes are done, groove the back side of the pocket stitching along the holes. I am not entirely happy with the over stitch wheel in the corners, I think I may look for an alternative--the book I got suggested calipers. Sew the holster together. Tandy sells wooden sewing clamps, but I made my own with scrap lumpber, screws and a bolt with wingnut. Take a thread long enough to do one continuous thread for each section, if possible. Put a leather needle on each end of waxed nylon thread, and center it in the starting hole. Feed each needle through each hole in turn. I run the left needle through first, pull it snug and out of the way, then push the right side partway through the leather. Switch the free needle to your right hand, then pull the other needle through the leather with your left. Repeat on each successive hole until you are at the end (or back to the beginning, if you are sewing a loop) Try not to drop your needles between stitches, and it will go much faster. Pull tight--the stitch you just did may go loose again, but the one behind it will stay snug. Once you reach the end, back up for 3 to 5 stitches. At this point the needles should be difficult to get through the leather--I use pliers here. You have to pull very straight, or the eye of the needle will snap. When you are done, run the thread on the front side of the holster to the back, and cut both threads flush with the leather. The final steps are wet molding, boning and burnishing. I will cover them in part 2. While walking the dogs, I saw a car with two bumper stickers--One an Obama/Biden sticker, the other saying "At least I can still smoke in my car".